Most houses in the region are built with mud, which is easily damaged and destroyed by rain. The Zambezi Region Governor has called on the newly trained brickmakers to contribute towards a lasting solution to housing challenges in the region. Mr. Ignatius Nkunga, Special Advisor to Hon. Governor Lawrence Sampofu, was addressing the trainees during the Ohorongo Buildit Brickmaking Academy training session at Katima Mulilo on 17 May 2018. Twenty seven people received vocational training skills in the trade of brickmaking. 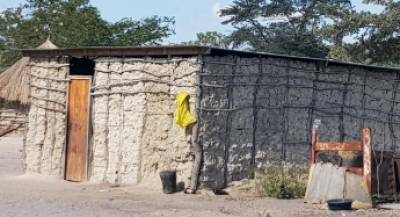 The message from the Governor was that most houses in the rural areas of the region, are built with mud bricks, which are easily damaged by heavy rains. The reconstruction of houses annually, he says, takes up a lot of time which could have been used for other productive activities. “Now that you have the skills to build permanent structures, I want you to use your skills to go and construct houses that are disaster resilient and will last for generations to come. We cannot continue rebuilding houses every year while the rest of the country is busy with other productive matters,” said Mr. Nkunga on behalf of the Governor. “There is a need to use better quality, rain-proof materials, such as cement blocks, that are not easily washed away by heavy rain and need little or no maintenance,” he said. Zambezi region is a natural flood plain and the region experienced by far the most severe flooding and heavy rains in the country. The Brickmaking Academy is the result of the Smart Partnership between Ohorongo Cement and one of its customers, the Buildit Group, established in March last year, in support of Government’s development policies, as well as poverty eradication efforts. “The Brickmaking Academy is not just a tool through which we can eradicate poverty, it was created as a tool to restore the dignity of our people. We would like to see people all over the country having decent and permanent shelter,” said Mr. Hans-Wilhelm Schütte, Managing Director of Ohorongo Cement. During the brickmaking training session, the trainees received guidance on the right aggregates that is most beneficial to use during the brickmaking process. Beyond the training, Ohorongo technical team, together with a support team from the Buildit stores, will continue to provide technical assistance and advice to the trainees, to ensure the best outcome in the production of high quality bricks. “It is the bags of cement sold to our customers that are made into bricks and blocks that keeps the economy growing, and enables people to build better and stronger houses. With an initiative such as this, Namibians would be able to enjoy quality of life if they have stronger houses,” said Paul Hinson, Category Buyer for the Buildit Group. The next brickmaking training will be held in Karas- and Hardap Region next month, followed by the last region to receive training, Omaheke, in July.